Otherwise, I wouldn't be in the midst of dropping both Lucy Liu's Marry Me and Alyssa Milano's Sundays at Tiffany's to DVD right now. What? I'm a girl. I'm nearing midlife. I'm single. Clearly, I'm totally the demographic that Lifetime is aiming for. The thing is, Mayer's quote has been true all of my life. Whether it was Louisa May Alcott's Little Women in the fourth grade, Iris Johansen's And the Desert Blooms in the seventh grade, or Sarah MacLean's Nine Rules or Ten Ways just this year - the hallmark of a good story for me, is whether or not I sniffle. And it's not just books - it's movies (hello, The King's Speech or Tangled at the end) and television shows (hello, Rose and Ten's goodbye on Doctor Who), too. Shoot. Even a really good painting or music composition gets me all teary. So, yeah, I'm really a sap. I'll own it. 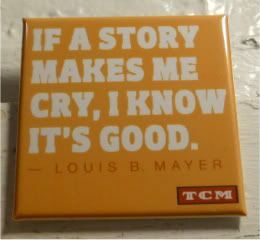 That's why, when I saw this Mayer magnet on TCM's Moguls & Movie Stars shop, I knew I had to order it. I'll confess, I actually had to restrain myself from buying the whole set. Of course, that in itself, is enough to make anyone cry.